Nigarila wordpress theme – Free. You are here: Home / wordpress theme / Nigarila wordpress theme – Free. 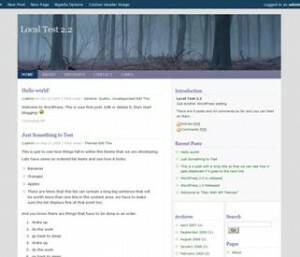 Top10WebHosting has recently sponsored a new beautiful wordpress theme for everyone to use. NigaRila is a three-column wordpress theme with features like “Theme Options Page”, “Custom Header Image” etc. You want to display posts from certain category to be displayed on the sidebar, instead of the main content area ? With this theme you can choose two different categories, so that posts from these categories are displayed in the sidebar. The pages you create within the wordpress admin, are automatically displayed in the top navigation. This theme allows you to specify your name and email address, so that all your comments will be highlighted. It helps in getting your comments to have more focus. After all, it is your blog, isn’t it? Your visitors will build a trust on you, if you are not posting anonymous. Just write a small introductory text about yourself on the theme options page, and it will be displayed in the home page.